For introductions, I'm Shirin, an undergraduate at Bristol University. I will be working with my partner in this project and fellow undergraduate, Jessica, to help produce a piece of artwork to go on show at the new life sciences building at the university. 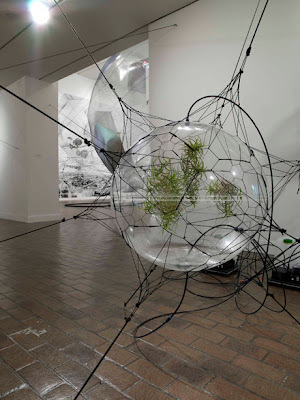 Our responsibilities include coming up with ideas and testing their plausibility to help the artist Tomas Saraceno, achieve his vision for his piece for our department. His ideas involve about 5 glass spheres suspended in a spider-like net. Our job is to consider what could go in each of these spheres and test the ideas. The first day of our work on the project initially involved a tour of the department and introductions to many members of staff whom we'd be working with over the next few weeks, as well as getting to know each other. After our morning of settling in we started to prepare for a conversation with Tomas Saraceno and his assistant Adrien over Skype at 3pm. We allready had many questions and suggestions for the piece. -How long would the piece be up for, or how often could it be replaced/maintained? This would be vital for the practicality of keeping living things. -Would he be willing to grow fungi in the spheres as well as plants, this could make for some very interesting colours. -The idea of growing plants upside down. -The issue of condensation collecting on the glass if it contained living things, obscuring the view from the outside. -The issues of keeping the spheres sterile, a possible essential for some ideas. -The possibility of having an aquatic sphere, how much weight can the spheres hold, and how will they be supported? We both highly suggested that in many cases, inorganic structures simulating an illusion of life would be far more practicle. There would be very little to no maintance involved and there would be barely any limit on creativity. Using living organisms could be very limiting as many factors need to be met to keep them looking alive and attractive. We thought a very nice idea, especially for at least some of the spheres, would be to use organic materials such as iridescent beetle shells or feathers for example, to create sculptures such as those of animals or diatoms. We heard of a paint made from iridescent diatoms that sounded great for painting some of the possible sculptures. In many cases part of the net and spheres could show a macroscopic view of a microscopic world, such as with the diatoms, or parts of the net could represent neurons. Other ideas include having one of the spheres open with many climbing plants which could wrap around the cords supporting the sphere. We could grow algae within the spheres or within the tubes that support them. Tomas was very keen on the idea of having experiments within the spheres. We thought this was perhaps best achieved by a single demonstration sphere, which could be easily interchangeable and perhaps represent work from many departments for a short period of time each. The project work of students could also be given some publicity in the sphere so that this artwork becomes very communal within the life-sciences department. Ideally we want the spheres and net to represent all the departments, rather than representing more of one than another. We thought that running experiments for many different ideas and then allowing the staff to select 4 (as one of the 5 is taken up by the demonstration sphere), aswell as ideas for the appearance of the net that they thought would be the best, would be the most fair way of choosing the ideas for the final spheres. We finished our day by sending out our first lot of emails to set up some meetings with members of the department to talk over some of our initial ideas ready to start experimenting for the next day.